There's an unwritten rule in most martial arts schools that says you should not make contact with the face. A focus (pulling back on any type of strike) is considered good etiquette, but may deprive you of some realism. In tae kwon do, punches are not allowed to the head, but kicks are. Focusing a punch requires much less finesse than focusing a kick, so if your defensive skills aren't up to snuff, and your opponent can't pull her/his round kick too well, you'll end up taking a nap. Blocking techniques with your noggin a la Jake La Motta is never a good idea. Head shots are dangerous. It's somewhat ironic that muay thai kickboxers must wear steel groin protectors, but are allowed to use knees and elbows upstairs. At least those guys have their priorities straight. To a streetfighter, the target of opportunity is the head. Always. Having a good "chin" is considered noble in boxing. In traditional karate, one primary target is the solar plexus. Getting the wind knocked out of you sure beats getting knocked out. And taking some hits to the breadbasket won't make you senile before your fifty. Some practitioners, especially in karate, have developed the habit of sparring with their hands held low, and this is definitely because of the stay-out-of-the-head rule. As the boxing referee advises, "Protect yourselves at all times." I've seen some Taekwondo black belts who rarely even use their hands for anything other than blocking in competition. This from chest level with their heads wide open. That's OK for competition but I hope their schools teach that in a self-defense situation you must have your hands on guard to protect the entire body. Funny thing: I was watching the dvd of our competition and the first thing that Sabum pointed out is how I fight foreward like a boxer. This from my brief foray into boxing. Even when I dabbled in Wing Chun I was taught a modernist approach where we fought forward. Problem is fighting forward in a karate tourny opens your head up to crescent and axe kicks. I am painfully aware of this as my instructor loves to tag me with light crescents and axe kicks when I make this mistake! Everything differs from school to school and taekwondo is no exception. Our school tries to integrate traditional tko with a modernist approach. In point or contact sparring and especially in self-defense we are taught to use un-chambered kicks (and punches) from the front to feel an opponent out and set him/her up for a combo or chambered finisher. Whatever the case, most kicks--be they taekwondo or karate--in a street situation will be waist level and below. Also, many kicks that require spinning or pivoting may be out depending on the ground surface and your shoes (unless you want to blow a knee out). So, hand techniques become very important. ALWAYS protect your head! It's the main target of street fighters and thugs. Well, being a Songham Taekwondo person, I know our specific organization is very clear about using protective gear (that is, you MUST wear it! )and technically, we aren't supposed to actually make full contact, or if we do, it's light contact. Equally, we are not supposed to kick below the belt, or the backside. And we DEFINITELY MUST keep those hands up for blocking and execute chest hits! I know I can block the kicks, but I tend to leave myself open when kicking, and don't protect my chest like I should-- a skill I'm working on. I've seen some REALLY low guards happening, and I always wonder how often these people have had to fight someone who has a quick head high kick? Yep. Protect yourself at all times. I actually forgot that rule saying and paid the price. Oh well, it won't happen twice. In our karate school we aren't allowed to punch to the head. However, backfists and ridgehands are allowed. These can be just as hard as a punch in my opinion and people get carried away and hit much harder than they should. Nobody hardly ever pulls their strikes...they aren't skilled enough to do that so they just swing away and nothing is ever said unless someone gets clocked especially hard. 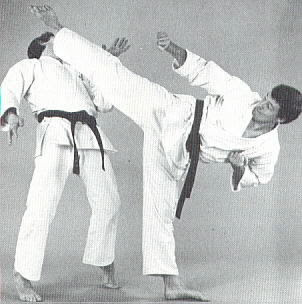 Few in my class are able to kick to the head. So they don't even try it. It's always interesting to me to see all the different rules from different schools. We allow punches to face level but you are expected to control and pull them, not to hurt someone, in regular dojo drills. We are not supposed to do ridge hands and rarely to do backfists because most people find them so much harder to control than a punch is. And something in me will never understand why a dojo would allow you to kick someone in the head, but not punch them! (maybe because kicks are slower, and you're supposed to be able to block them because you can see them coming? don't know...).